Case management reports should ensure that all occupational health referrals are dealt with in an efficient and timely manner. Lara Carmel explains how OH practitioners should approach this task. Preparing and writing occupational health reports to management are central to a productive collaboration between the organisation and OH services. A well-written report is an indicator of a high-quality service, as well as facilitating effective and efficient communication between managers and OH services. Therefore, it is important that OH practitioners develop skills for writing clear, concise, unambiguous and actionable reports. It is also important that managers are provided with guidance so that they can ask the right questions when they refer an employee to OH. A recent article (Everton, 2011) highlighted the problem of poor report writing. Report writing is a skill that requires regular practice. Important principles include: keeping sentences short and to the point; when giving the employee’s opinion use phrases such as “the employee stated, cited, reported, perceives or believes”; when giving a clinical opinion, use the phrase “in my opinion”. The most important single aspect is always to answer the questions asked, while focusing on the OH aims of enabling people to work safely and healthily. The report is often the main interface that a manager has with OH. Unambiguous reports will avoid the need for additional communication with managers in order to provide clarification. The report should give clear guidelines on timescales for recovery. When stating a phased return, hours and duties must be clearly written so that they can be implemented and a copy of this advice should be kept in the employee’s health record. Referrals are the means by which managers or HR direct the attention of employees to OH, with a view to gaining professional medical advice on an employee’s fitness for work. A sound framework for referral is helpful in building a productive relationship between OH and the line manager. When managers are clear on the circumstances in which to refer staff, and they are clear on what they can expect from OH, the foundations for an efficient and effective service are laid. Managers will expect specific case-related answers to the questions that they have asked in the referral. In order for managers to ask informed questions in their referrals, they need to be aware of the remit of the OH service; it is therefore useful to provide reference guidance, for example on an organisation’s intranet. This published information could include a description of the service provided by OH, when and how to refer an employee, and what to expect from OH. In addition, training can be given by the OH service, in conjunction with HR, to line managers on the subject of absence management. More information can be found on the Acas website. Managers must also be reminded that employees referred to the OH service should be informed of the reason for the referral and given a copy. Ideally, a leaflet detailing what to expect from the OH consultation could be given to the employee at this point. This will reassure the member of staff and should reduce any anxiety that the referral might cause. main concerns and reasons for referral – to include what measures and adjustments have been discussed and/or tried to help the individual in the workplace. It is important to emphasise to managers that concise, detailed information enables OH to give a balanced opinion of the situation following the consultation with the employee. In some circumstances, it can be helpful for managers to call OH to discuss a case prior to referral or consultation. Is there an underlying health problem that affects attendance/performance/fitness to work? Is the employee medically fit for the post? If not, when are they likely to be fit? Is the employee likely to provide a regular and effective service on return to work? What reasonable adjustments need to be considered to keep the employee at work/assist the employee back to work? Should medical redeployment be considered? Lewis and Thornbory (2010) give suitable templates for management referrals in the back section of their book. In the OH consultation, it is paramount to discuss with the employee the outcome and the response to the referral that will answer any management questions. The information needs to be an accurate representation of the consultation – being specific about what will be communicated to the referring manager will help to avoid disagreement with the employee at a later stage (Richardson, 2008). 1. Include reason for current referral for OH opinion. 2. Confirm date of appointment and name of assessing OH practitioner. 3. Include what information was obtained during consultation. 4. Include relevant past medical history. 5. Report response to treatment/interventions. 6. Provide advice about current treatment regime. 7. Report any further referral for specialist opinion. 8. Ensure that all referral queries are answered. 9. Ensure that there is clinical justification for all comments made and recommendations given. 10. Explain what impact symptoms may have on a likely date of return to work. 11. Provide specific time limits for duration of sickness absence and a return to work. 12. Be specific in your advice regarding next steps. 13. Ensure that the client consents for the OH report to be sent. Always remember to maintain confidentiality unless written permission to disclose information is granted by the client. Where possible, it is always advisable to aim to get this permission in every case as it will prevent any later problems with management. Good practice is to give managers a clear indication of when they are likely to receive the report and this should be part of the standard process. If there is a delay for any reason, managers should be informed as soon as possible. There are a number of factors that affect the time that it takes to send a report, for example, a service level agreement, the urgency or complexity of the case, or if the employee requests a copy of the report first (GMC, 2009). If the employee withholds consent for the report to be sent to the manager, the manager will need to be informed and they will need to take action based on the information already available to them. The aim of the report is to convey specific information in a clear and simple style. Any occupational health report should be able to stand alone as an independent document, as it may be read by another manager with minimal knowledge of the original referral. The report should be written in the first person. Always use the employee’s/client’s surname when making reference to them. It is also important that the report has structure; this can be achieved using sections or a standardised format (Lewis and Thornbory, 2010). The most appropriate format will vary by organisation – what is presented in this article has been developed for a university but could easily be adapted for other settings (see box for checklist). In the introduction, state the name of the employee referred, the job that they perform, their length of service and a brief summary of the reason for the referral. In this section of the report, give clinical information; explain the nature of the condition and the likely prognosis. Diagnosis should not be given in the report unless it is stated in writing on the referral or the employee has given specific consent. If they are not receiving treatment, state whether or not there are any future plans for this. Comment on the physical impact of the condition on the employee’s ability to work, as well as mental, emotional and environmental factors. In this section, answer all of the specific referral questions, even if they are answered elsewhere in the report. It is likely that a busy manager will turn to this part of the report first. In order for the answer to be understood in context, it is recommended that questions are written out in full. This way, the manager does not have to search for the original referral. If it is the opinion of OH that the employee is fit to return to work with their current condition, explain why they are able to do so. Also comment on whether they are able to undertake the full duties of their role or whether they will require adjustments to their role for a temporary or permanent period of time. If the employee is considered not fit to return to work, then state the reasoning. Give an indication as to when they are likely to be fit. If it is not possible to be certain about timescales, then state this and explain the reasons. State what, in your opinion, could be done to expedite their ongoing recovery. Try to give an indication as to when it is likely that the employee will return (in weeks/months) and in what capacity. While timeframes can be difficult to predict, for some conditions the average recovery rate is well known (see, for example, the “Fit for Work” sections of the Royal College of Surgeons and Royal College of Obstetricians and Gynaecologists websites). Mention if the medical problem is likely to be caused or made worse by work activity. Use this section to comment on the adjustments related to the hours of work, shift patterns, types of tasks, increased supervision and regular review of progress and retraining. Be very clear on timescales and recommend that a phased return-to-work programme is closely reviewed for progress, both by employee and line manager. Also state whether restrictions or modifications will be temporary or permanent. OH cannot dictate adjustments, it can only recommend what would be medically appropriate and explain the reasons why. If, in your opinion, there appear to be workplace-related problems beyond purely medical issues that need to be addressed prior to the employee returning to work, these need to be mentioned in the report. For example: “I am not optimistic that [employee name] will return to work or their symptoms will resolve unless the management issues are addressed. Is the employee likely to have further absences? Further absence is always difficult to predict, although some illnesses are clearly recurrent. Always provide justification of any statement about high or low risk of recurrence, for example, “low risk due to one-off illness that has responded well to treatment”. Highlight anything that the employee can do to reduce their risk of future absence, for example, compliance with treatment, change in lifestyle factors or open dialogue with line manager. It is important to state the functional impact of the condition in relation to the employee’s ability to undertake their current role, now and in the future. It is worth stating at this point in the report that following the OH recommendations is likely to assist the successful return to work and minimise the risk of further relapse. In this section, document in detail the phased return-to-work plan and the recommended adjustments. Any recommendations should be time-specific and constructed with an awareness of business needs. If possible, discuss the recommended adjustments with the line manager prior to writing the report as this can help to ensure that the adjustments can be accommodated. Encourage the manager to think creatively about adjusted duties on a temporary basis. If adjustments need to be made permanently, this needs to be clearly stated. Recommendations should be written as advice rather than instruction. When writing each statement in a report, OH practitioners should ask whether or not the advice provided in the report is objective and defensible. In the report, detail the hours, days and restrictions recommended by OH and state why these will be beneficial. If the recommendations are complicated, a case conference with the line manager, HR and the employee would be advisable. Rehabilitation plans should be clear and unambiguous. However, they should allow for flexibility for the manager in case of improvement to an employee’s condition. This will decrease the necessity for further requests for OH reviews and OH reports following changes in the employee’s condition. Advice can also be given directly to the employee; for instance, to undertake or continue an exercise regime, to comply with medication, or to attend work-related social events. If it is likely that the employee would be regarded as having a disability under the Equality Act 2010 (the successor legislation to the Disability Discrimination Act 2005), it may be stated that reasonable adjustments would need to be made. Ultimately, the decision is a legal one, not medical. Guidance regarding reasonable adjustments can be found in Lewis and Thornbory (2010), pp.142-147. In this section, it should be stated that the contents of the report have been discussed with the employee and that they have seen, or been sent, a copy (GMC, 2009). The manager should then be encouraged to meet with the employee to discuss the recommendations in the report, regarding their implementation. Remember: a good report is one that clearly, concisely and comprehensively answers questions asked by the person requesting the report. Lara Carmel, PGDip (Health Ergonomics), BSc (Hons), DipOH, RGN, Cert OH Management, is head of occupational health at the University of Essex. Acas (2011). “Health, work and wellbeing”. Addley K, Hannah I, McQuillan P (2009). “Occupational health reports: top 10 tips”. 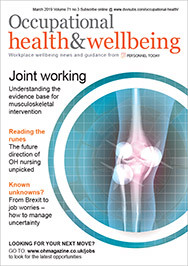 Occupational Health, August 2009. Everton S (2011). “Contract helps to stay on good terms”. Occupational Health, November, 63(11): 27-29. GMC (2009). “Guidance for doctors: confidentiality”. General Medical Council: September 2009. Lewis J, Thornbory G (2010). Records and reports, pp.33-54 in Employment Law and Occupational Health: A Practical Handbook (2nd edition). Chichester: Wiley-Blackwell. Paton N (2011). “Service level agreements: part one”. Occupational Health, November, 63(11): 24-26. Richardson PR (2008). Case management, pp.271-289 in Oakley K, Ed, Occupational Health Nursing, 3rd edition, Chichester: John Wiley and Sons. Royal College of Obstetricians and Gynaecologists (2011). Royal College of Surgeons (2011).